Another week of wearing homemades, and I am absolutely enjoying this challenge. I have been keeping my eye on the Flickr, Pinterest, and blogosphere feeds of MMMay14 and I must say, I am once again truly inspired. There are so many talented seamstresses out there with some great looking clothing. Everything from the basics to the very special. I have big holes in my homemade closet, no basics like shirts and such whatsoever. Just a bunch of dresses and some skirts. I used to have so many more skirts, but over the years many of them have been passed on to friends. I think I will be hanging on to what I make now, for a little longer than previous years at least. So this week, five more handmade items were worn, and it was mostly a week of dresses. Monday, May 12th: This blue skirt was made years ago. I found the material in a small fabric shop way back in my Santa Fe, New Mexico shopping days. At the time, it was some of the nicer fabric that I had and it took a little while for me to cut into it. The black designs are a velvety material, which is what I love most about it. I made it into this skirt from New Look 6637 that I only wore a few times before getting stuck in it. Let me explain… It is a wrap skirt and the last time I wore it, years ago, I knotted the ties so tightly that I had to cut them in order to get out of the skirt. I didn’t remember fixing it, but apparently I did because all ties were intact when I pulled it out of the closet last week. Tuesday, May 13th: School party day, and a windy day it was! Even despite all of the gusts, it was still a great day and this dress was perfect for the seriously warm weather. I even wore it out for dinner and drinks with my guy that evening – with much nicer shoes, of course. New Look 6778. Saturday, May 17th: And the last one for the week, my newest make – yet to be featured on the blog (the post is ready and waiting to be published, I just need some good outfit photos). 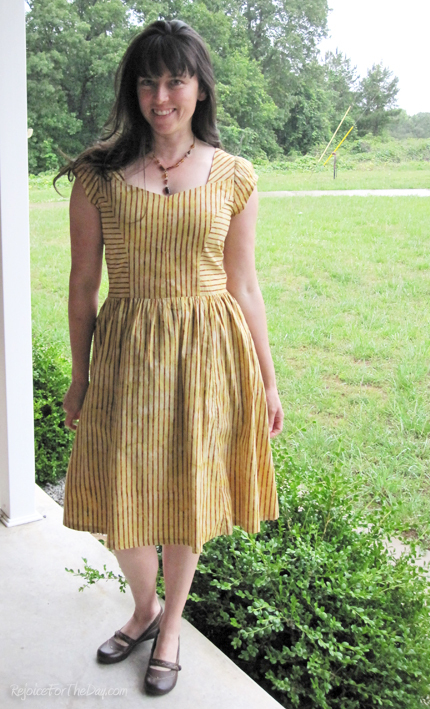 It’s another Simplicity 1803, first blogged about here. I think I am obsessed with getting the perfect dress out of this pattern. I am even thinking of making a third one because I am convinced I can get it perfect sooner or later. There you have it, my second Me-Made round up for 2014. Two more weeks left to go, and hopefully a few new things to make as well. My apologies for the less than perfect picture quality this week. I went with WordPress’s photo scaling options, and I am not happy with the results. I’ll have better ones next time. Love the red dress and your newest make, soo pretty! Thank you! The picture kind of distorts the color a little, but it is actually closer to an orange than a red. 😉 I really like the style, but my favorite thing about it is the pattern of the material.